Get rid of the abductor soreness by treating the problem right away. No doubt about it. If you’ve got sore abductors after you exercise, you have to take care of them. As essential muscles for both exercise and general movement, the abductors should be treated with priority any time they are uncomfortable or sore. If you choose to ignore the pain instead, it could lead to serious injury. And why be sidelined when you could stay in the workout routine simply by caring for your body? Taking care of the issue now equals better workouts and pain-free living in the future. Hip abductor pain can be just that -- a pain. Most common in runners and endurance athletes, it often shows up when you increase your exercise level like you would if you were training for a marathon or big race. Caused by a number of contributing factors including inflammation and overuse, abductor pain and soreness can usually be traced back to muscle imbalances and weaknesses in the core. According to Core Performance, muscle groups must be balanced in strength in order to work together properly. Thus, if your hip abductors and surrounding muscles aren't strong enough to do their share of the work, the other muscles will compensate for the weakness. And this will eventually lead to pain or injury. Depending on how sore or painful your abductors are, you may need to take a little time off from working out, at least until you’ve treated the area on your own or have had it looked at by a pro. If your abductors are just sore or slightly painful, ice can be your best friend. Applying a cold pack or ice bag will help relieve the inflammation and speed up the recovery. Also, pop a couple of anti-inflammatory pills and massage the area by rolling it out on a foam roller. If these do-it-yourself treatments don’t work, see your doctor to find out if something more serious is causing the pain. The best way to beat abductor soreness is to fix it long term and aim for a permanent solution. That means strengthening your core and stabilizing the area for ongoing and future activity. According to “Running Times,” weak hip musculature should be treated by working on hip and core strength in all planes (front, back, in and out). Strengthening your total core and correcting muscle imbalances is the key to long-term relief. When fighting the battle of the abductors, developing core strength is the key to recovery. Focus on developing the muscles of the back, abs, glutes and hips, which, according to Bodybuilding.com, are responsible for providing stabilization for your body and for transferring power between the upper and lower body. Develop these muscles by doing simple, effective exercises like planks, bridges, back extensions, one-legged squats and medicine ball crunches and twists. Also, work the abductors themselves by incorporating hip circles and lunges. It may sound cheesy, but you can say good-bye to the sore when you strengthen your core. Bodybuilding.com: Strong to the Core of Your Being! Columbus Sports.com: Just why is the core so important? Huffington Post: What's So Important About Core Strength? 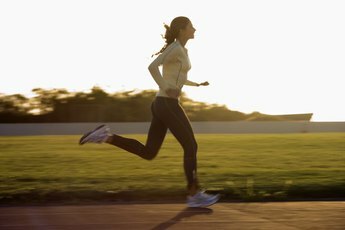 Competitor.com: Sports Science Update: Do Strong Hips Prevent Knee Injuries? Do You Use Your Hip Abductors & Adductors in Running?